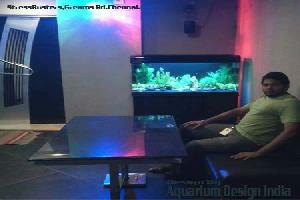 Aquarium Design india is the culmination of more than 25 years of combined experience in the aquarium field. As India’s premier aquatic design firm, we specialize in creating living art for both commercial and residential applications. If you can dream it we can build it. Sharing the beauty of aquatic environments in all their variety is what we at AQUARIUM DESIGN INDIA value most, and we bring a flawless reputation and Twenty-five years of combined experience to the job of providing service to our clients. Mr.Abdul Jabbar (JBR), is one of India’s leading experts in aquarium technology and design, always had a passion and love for the exotic beautiful marine fishes. And for the past 25 years was attached professionally to the marine aquarium industry in Maldives as a Marine Researcher in Live fish (PVT) Ltd Company Maldives, Star Maldives, Varity marine Sri-lanka , E I (pvt) limited Bangkok Thailand, N I S M Ltd. Singapore, Marine life aquarium India, Tropical Marine Care Chennai, Aquarium India Chennai, also a scuba diver and Member, have now proceeded to services in Aquarium Design India, and heartily welcome all pet lovers in India to explore with him on this fascinating hobby. Our team of specialist aquarium technicians have many years of experience in the aquarium business. Our research and development team allow us to stay at the forefront of aquarium science, offering you the benefits of our knowledge and expertise. We have office in chennai - but we also carry out larger installation jobs throughout India. We are fully staffed with skilled aquarium specialists and technicians who are supported at all times by directors of operations, service, and livestock management. Staff is available to customers in-store and out. In our Chennai, Spencer Plaza showroom we display a wide variety of the latest tanks, aquarium lighting, and filtration systems. Our knowledgeable, devoted staff is there to answer your questions and make recommendations. We select and offer the most materials only from sources that meet our strict standards for quality, and we work only with suppliers who use proper and ethical methods of collection. All our livestock are guaranteed.